At Relationships Australia (Qld) we believe healthy relationships are essential for the wellbeing of children, families and communities. There are times in life when we all need help. We are committed to offering the best possible counselling, mediation, education and support services in a professional, relaxed and confidential environment. We are committed to social justice and inclusion. We have no religious affiliations and respect the rights of everyone to live with dignity and safety and to enjoy healthy relationships. Over 400 highly qualified and experienced staff make up the heart and soul of Relationships Australia. It is our people that make us who we are today, a leader in relationship support services. We provide services from more than 30 centres across Queensland and can work with you face-to-face, by telephone, on-line, in one of our centres, or elsewhere. We provide special services to people who are disadvantaged. We support people living in Aboriginal and Torres Strait Islander communities, those suffering from family violence, poor mental health, addictions, people who are socially excluded and those living in remote areas. We recognise that Queensland is a culturally and linguistically diverse state and is continuously working towards developing a quality service that is inclusive and sensitive to all Queenslanders regardless of their cultural, language, ethnic or religious background. We work with you to build a better future: for you, your children, your families and your communities. Building healthy relationships for stronger communities. To promote relationships that are respectful, fair & safe, particularly where people & communities are at risk or vulnerable. Client Focus - We commit ourselves wholeheartedly to our clients' success - understanding and responding to the individual needs of people accessing our services. Social Justice - We are committed to equity and social justice. Healthy, Respectful Relationships - We believe that healthy and respectful relationships are fundamental to individual and community wellbeing. Accountability - We are accountable and open in our operations. Integrity - We act ethically, honestly, and in the best interests of the community. Respect - We respect each other and the principles of equity and diversity. Professionalism - We value the contribution and expertise of staff and commit to high standards of service and performance. Reconciliation - Our vision for reconciliation is that Australia's first peoples, the Aboriginal people of the Mainland, connected islands and the Torres Strait Islander peoples are recognised, engaged and respected in all our work. 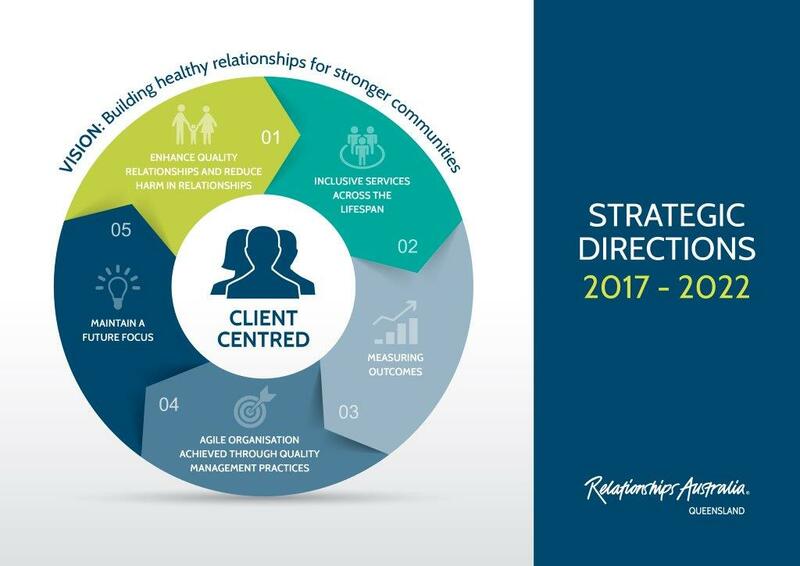 2017 saw the roll out of our Strategic Directions 2017-2022. At the heart of our strategic priorities remains a focus on client outcomes. We are driven to achieve enduring positive change and making a difference in the lives of our clients and the community. Our vision is for an Australian society which upholds Australian Aboriginal and Torres Strait Islander people’s perspectives and unique place in Australian history and social fabric through respectful relationships in all of their diversity. In the achievement of this vision, our role is to support the delivery of quality services to Australian Aboriginal and Torres Strait Islander people and engage in the development of culturally appropriate policies and practices which reflect the needs and aspirations of Aboriginal and Torres Strait Islander communities. In launching our first RAP in 2011 we embarked upon an ambitious journey to take the whole of our Organisation into a new paradigm of relationship with the First Nations People of Queensland. Guided by our Head of Aboriginal & Torres Strait Islander Programs we established a Senior Management RAQRAP Working Group which included our previous CEO Shane Klintworth. We then established our Aboriginal and Torres Strait Islander Staff Working Group and an Aboriginal and Torres Strait Islander Community Working Group which included leaders and Elders from within the local community. These groups were all facilitated by the Director of Aboriginal & Torres Strait Islander Programs to develop the direction, framework and core values for our RAQRAP. Once the framework for the RAQRAP was developed every member of our workforce participated in a consultation process over twelve months to share their perspectives on the RAQRAP and how it could be implemented within the workplace and with local Aboriginal and Torres Strait Islander communities. Venue staff sought the advice of our Aboriginal and Torres Strait Islander staff and consulted with existing local Aboriginal & Torres Strait Islander Reference Groups. This is a 2014-2015 update of the plan which takes into account both short and long term goals of our organisation. The First RAQRAP provided a clear vision for why we are working with a RAP and what we want to achieve, this revised RAP provides a more focussed framework for how we can achieve the goals we have set for our organisation. When the revised ‘Innovate RAP’ is completed, it will be posted here. What’s the meaning of reconciliation? How can you contribute? To learn more about reconciliation in Australia, you can click here. At Relationships Australia, a number of our services are free. We are a not-for-profit community organisation and only partially funded by the government, so fees are normally charged. However, we do try to make our services as affordable as possible. Our fees for counselling are $75 or $35 for concession card holders for a 1 hour counselling session. Family Dispute Resolution Sessions are $35.00 per party for the intake session and $75.00 per party. If you are unable to afford this, we have fee reduction available to all our clients. We also offer a number of our services at no cost to the client, call 1300 364 277 to find out more. Relationships Australia was founded over 60 years ago, with the aim of providing support and advice to people experiencing difficulties in their marriages, during the social upheaval of the post war period. At that stage, it was known as The Marriage Guidance Council. Australia’s first Marriage Guidance Councils, relying heavily on the British model for keeping husbands and wives together through counselling and educative programs about marriage and family living, were established in Sydney and Melbourne in 1948. Over the next few years the other States followed suit and by 1952 the national organisation had been established. From the start, the national gold standards were marriage and relationship counselling and education; setting professional standards; and training and accreditation. A 1968 report by the NMGCA National Secretary, after visiting counselling staff across the country, described ‘a recognisable common quality of spirit and skill that distinguishes them as having been trained within the Marriage Guidance Council framework’. Though the 1960s was a period of massive social upheaval around the world, the Marriage Guidance Council still saw its core purpose as preventing marriage breakdown. In the next decade, however, changes in family law heralded a different emphasis for the counselling profession. Personal relationships in all their diversity and complexity were considered. By the early 90s, the title Marriage Guidance Council was beginning to seem outdated and even misleading. Many more couples were living together, without having married, but still sometimes needing guidance on emotional issues affecting their partnership. In 1994 the Councils in all States agreed to the new name Relationships Australia, signifying a broad approach that valued all kinds of personal relationships in a healthy society. Relationships Australia is all about quality relationships. Among the steps taken towards a more enlightened professionalism have been: the requirement that clinical staff have tertiary qualifications; an increased awareness of domestic violence and the development of appropriate practice models; an increased awareness of the importance of the voices of children being heard and their wellbeing considered paramount; and the range and style of services provided having expanded way beyond the ‘staples’ of counselling, community education and mediation. Counselling services have expanded to encompass individuals and families, education programs cover pre-marriage, couple relationships, post-separation, step-families, communication skills and fly-in fly-out relationships. The growth in the community services sector has led to the development of services that now include: family dispute resolution, child contact services and Family Relationship Centres. These, and many more steps, have shaped Relationships Australia into the dynamic, professional organisation it is today, constantly refining and adding services to support all kinds of relationships, reflecting the complexity of 21st century life. Relationships Australia (Qld) is committed to a client’s right to confidentiality and privacy, and ensures protection of client records in adherence to privacy and legislative requirements. Relationships Australia (Qld) is also committed to providing clients with information regarding their rights, including limits to confidentiality when legal and duty of care considerations are deemed necessary. Our commitment to confidentiality exists alongside our duty to uphold the law and to protect the health and safety of our clients and others, in particular, children. Personal information collected by Relationships Australia (Qld) is handled in accordance with the Privacy Amendment (Enhancing Privacy Protection) Act 2012 and the Australian Privacy Principles. We will manage personal information in accordance with the law and in an open and transparent way. Individuals have the option of not identifying themselves, or of using a pseudonym, when dealing with our organisation. We will not collect personal information unless the information is necessary for our service delivery. We will not collect or share sensitive information without a person’s consent. We will not use or disclose your information for the purpose of direct marketing without your consent. We will endeavour to ensure all personal information that is collected is accurate, up-to-date and complete. We will put security measures in place to protect personal and sensitive information from misuse and unauthorised access. Any individual whose information is held by us can access their information and correct any inaccuracies. We will dispose of personal and sensitive information in accordance with legal and funding body requirements. If you access services funded by the Federal Government, your first and last name, date of birth and gender will be used to track the relationship and family service/s that you access. This will give the funding bodies a picture of how referrals are working and how well services are matched to client needs. You will be asked for other non-identifying details including demographic information; the reasons for seeking services and your experience with our service/s. Our staff will use this information for research and evaluation to improve our services and to provide confidential reports to our funding bodies. We will always ask for your consent to participate in these processes and participation is voluntary. A standard video surveillance security system operates throughout the building and grounds of RAQ venues. Security surveillance cameras may be situated to provide coverage of car parks, front entrances, reception area, rooms where services take place, outside garden areas, also in the rear of buildings. All video surveillance recorded is subject to court subpoenas and police warrants and will be handed over to police and Courts on appropriate request. This is a standard security monitoring system for the organisation. Relationships Australia (Qld) collects personal information from you (with your consent) in order to make high quality assessments of you and/or your family’s needs and the most appropriate services to meet your needs. If we are going to provide an on-going service to you, we will need to store details of our interventions and assessments in the form of a client file (paper and/or electronic). We need to keep detailed client files as official records so that we can ensure you receive a high quality service. In the event that your usual practitioner is not available (and you are agreeable), we could have another practitioner review your file and the plans going forward to ensure you continue to have positive momentum. It also allows our experienced supervisors to review practitioner progress with you to ensure everything is on track and in line with best practice. Additionally, some personal information is used to report back to our government funding bodies to demonstrate the value of their investment. It may also be used in internal research and evaluation to continually assess the impact of our services as well as their quality. Your identifying information will not be used in any report or publication by Relationships Australia (Qld) or our funding bodies. Relationships Australia (Qld) has strict processes to protect personal information held about clients. This includes secure physical storage of records, the security of our premises and the protection of electronic records. Client files are securely disposed of in accordance with funding body requirements, and in line with appropriate legislation. Any information stored electronically will remain in a database in non-identifiable form. In accordance with our commitment to service excellence and quality control, we frequently conduct internal staff training, clinical supervision and research using audio or DVD recordings of client sessions. We will always obtain your permission before recording any session with you. These recordings are kept strictly confidential within the organisation, are stored securely for a maximum of 2 years and then destroyed. 4. To prevent or lessen an act of violence or any threat to a person’s life, health or property. You have a right to access personal information that Relationships Australia (Qld) holds about you and to amend information that is incorrect. You may request that we share your confidential information with another service provider or a third party may request information. We require your written consent to disclose information under these circumstances. In some cases we will be unable to comply with the request for legal, privacy or safety reasons, for example, if you attended our service with another person and that person has not given their consent to share the information. If you wish to access your personal information, or would like further information, please call our Client Contact Centre on 1300 364 277. Relationships Australia (Qld) welcomes feedback. If you have a complaint or feedback about how we manage privacy issues or your personal information, please contact us on 1300 364 277 or email complaints@raq.org.au. Please refer to our Client Complaint Management Policy for information on how we will work with you to resolve your concerns promptly and fairly. Under what circumstances would we disclose personal information to overseas recipients? Your personal information will not be disclosed to an overseas recipient without your consent. Any overseas recipient country must either comply with the Australian Privacy Principles and/or have an enforceable law to protect information that, overall, is at least substantially similar to the way in which the Australian Privacy Principles protect information. If we are seeking your consent to disclose your information to an overseas recipient, we will also declare to whom and which country that information may be provided. Relationships Australia (Qld) ensures any disclosure of personal information to an overseas recipient is conducted in compliance with the Australian Privacy Principles (Section 8: Cross-border Disclosure). Relationships Australia (Qld) values the opportunity to hear about your experience with us and to improve the services we offer. If you wish to make a complaint, we will treat it seriously and work with you to resolve your concerns promptly and fairly. speak to the Manager at any of our Venues. Our staff members are able to help if you would like assistance to make a complaint. We offer interpreter services and other supports if required. We will contact you as soon as possible (and certainly within 5 working days) to let you know we have received your complaint and the next steps we intend to take to work through your concerns. We may need to obtain more information from you or simply discuss your concerns further in order to work out the best outcome. In some cases we may also need to conduct an investigation into your complaint, which could involve interviews with relevant staff members and a review of your file over a number of days. We work to achieve a mutually agreeable outcome within 30 working days of first contacting you about your complaint. Often a resolution is reached by discussing the matter further and agreeing on an outcome. In other cases, we will write to you about the findings of any investigations we have undertaken and how we intend to improve our services as a result.